Tablet competition never ends up, bringing about series of tablets one wave after another, among which iPad Mini. It will surely bring one more triumph to the Apple Company and will be a sales juggernaut that time thanks to its rumored cheaper pricing, high resolution, say, 1024X768, and small body size (7.85 inches screen). With so fantastic and impressive display and smaller body, iPad Mini naturally becomes the ideal gadget for people who are longing for watching DVD movies on it anywhere anytime. Perhaps you would doubt it is nonsense for there is no DVD drive on the new tablet. Actually, you are wrong if you think it is impossible to import DVD to iPad Mini. To do this job, you need to convert DVD to the new iPad Mini friendly format with almighty software, say DVD to iPad Mini ripper. However, DVD conversion is far from easy as many commercial DVDs nowadays come with copy protection technology like CSS encryption, Disney New DVD copy protection, Sony ARccOS DVD protection, etc, all making DVD ripping process a hard nut. Well, MacX DVD Ripper Pro stands out from other similar software, letting you decrypt any DVD movies and rip to the new iPad Mini on macOS with a couple clicks while retaining original video quality. We provide two different versions for different users, so please choose the correct version. After free download this DVD to iPad Mini ripper on Mac, click "DVD Disc" button to import the DVD movie you want to rip. You can also hit DVD folder by clicking "Path" button. Since you want to import DVD movies to the new tablet, here you can choose "to iPad and Tab" as output video format. In addition to converting DVD to the new iPad Mini, you can also feel free to rip DVD to numerous video & audio formats like MP4, MOV, FLV, AVI, etc that playable on popular multimedia player with this iPad ripper. What’s more, by adding new profiles for Apple iPhone 5, this professional DVD to iPad Mini ripper also succeeds in ripping DVD to any generations of iPhone, even the newly released iPhone 7/7 Plus, iPhone 6S/6S Plus, iPhone 6/6 Plus. With this Mac DVD ripper, you could enjoy favorite DVD on the go. After finish the above steps, click the "RUN" button to start ripping DVD movies to iPad Mini on Mac OS, you could view the conversion progress and are able to cancel the converting process at anytime. Note: for those who are eager to copy DVD Mac , this DVD to iPad Mini ripper works like a charm to backup any DVD movies by getting rid of all the copy protections. Thus you can store it on your Mac or USB hard driver, and play with VLC player or Quicktime Player on Mac OS X. Thanks to the sister software from Digiarty - MacX MediaTrans, you can eventually transfer DVD to iPad without using the complicated iTunes, away from countless iTunes crash, stuck troubles. 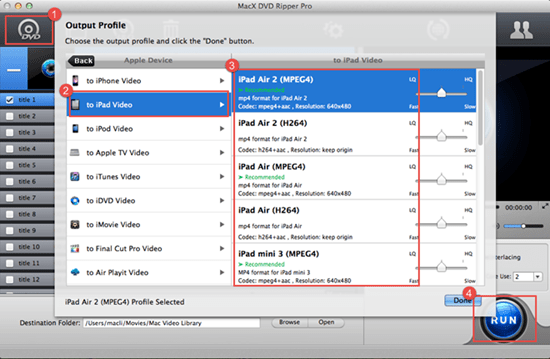 This is a tutorial about how to rip DVD to iPad on Mac with MacX iPad DVD Ripper. With this DVD to iPad Ripper, you could play all DVD movies with iPad on the go.